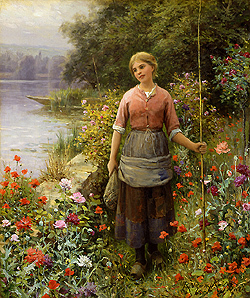 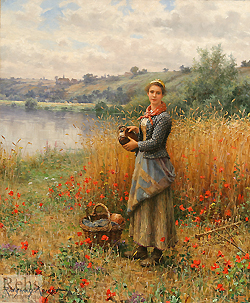 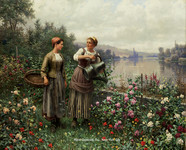 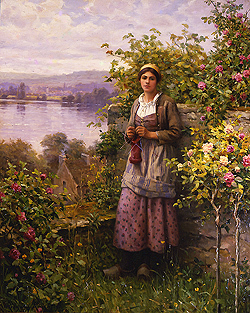 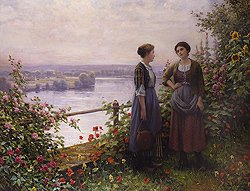 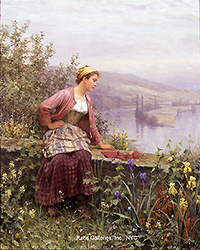 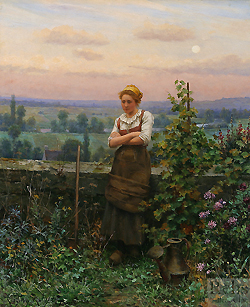 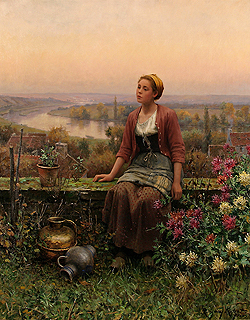 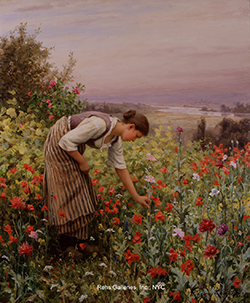 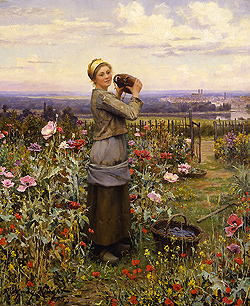 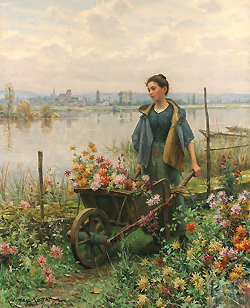 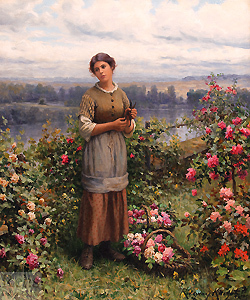 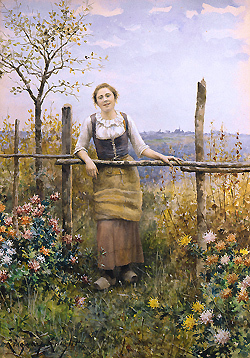 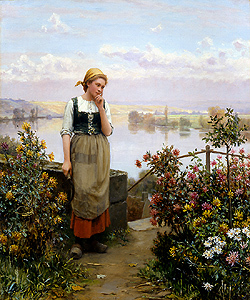 Daniel Ridgway Knight's works represent so many aspects of Nineteenth-Century painting, including history, genre, landscape, portrait, and floral themes. 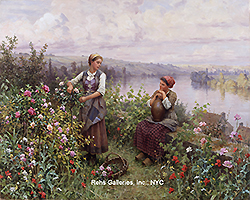 In each work, all that is aesthetic is recorded with fine detail and skill. 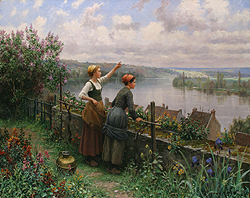 In order to faithfully record the scenery, Knight studied the different phases of the day and their effects on the environment. 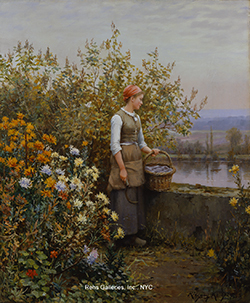 Knight built a glass studio outside of his home, enabling him to paint outdoors, even in the dead of winter. 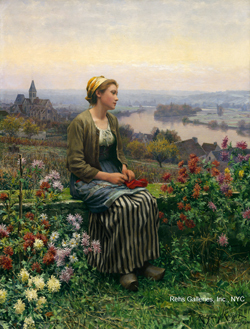 Whether he was concentrating on the evening with the glow of moonlight upon the Seine River, or on a young woman in a brightly colored flower garden at midday, each scene is depicted with great detail and with specific attention to a realistic portrayal of the landscape. 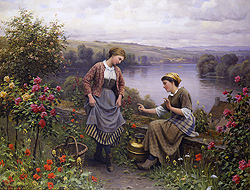 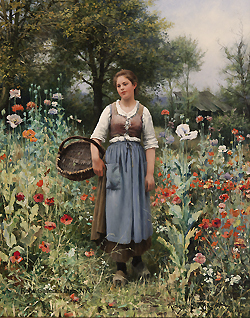 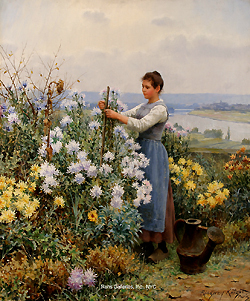 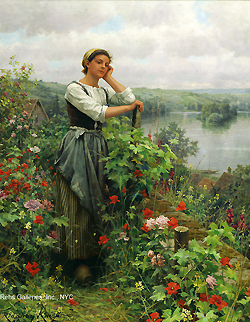 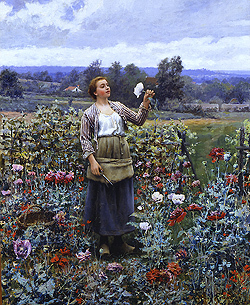 Daniel Ridgway Knight was born on March 15, 1839, in Pennsylvania. 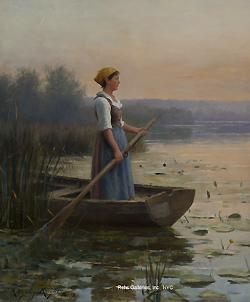 He studied and exhibited at the Pennsylvania Academy of the Fine Arts, where he was a classmate of Mary Cassatt and Thomas Eakins. 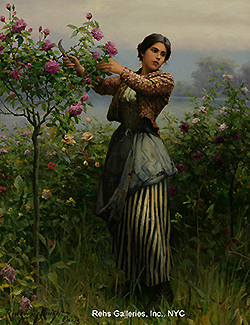 In 1861, he went to Paris to study at L'Ecole des Beaux-Arts under Cabanel, and to apprentice in the atelier of Charles-Gabriel-Gleyere. 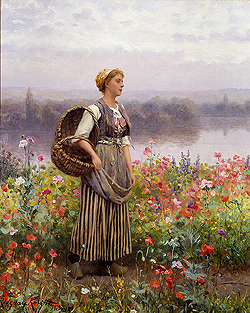 He returned to Philadelphia in 1863 to serve in the Union Army. 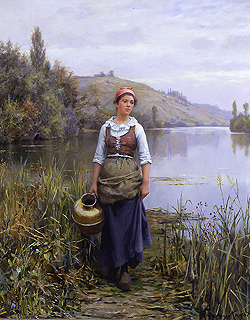 During the war, Knight practiced sketching facial expressions and capturing human emotion in his work. 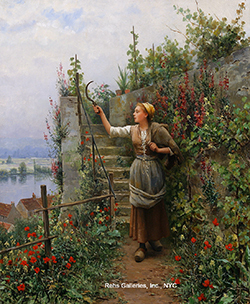 He sketched battle scenes, recording the war for history. 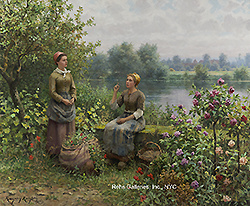 He founded the Philadelphia Sketch Club, where he showed works that dealt with the Civil War, mythology, and scenes from opera. 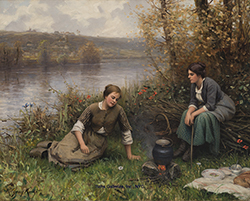 In 1871 Knight married Rebecca Morris Webster and after the wedding, he began working as a portrait painter in order to make enough money to return to France. 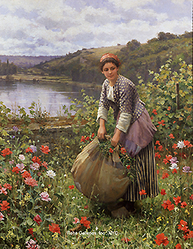 In 1872, once settled in France, Knight befriended Renoir, Sisley, and Wordsworth, all of whose influences can be seen in his work. 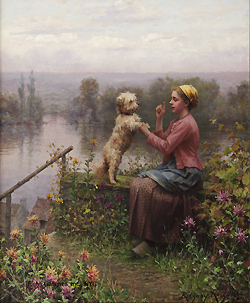 He also enjoyed a close relationship with Meissonier. 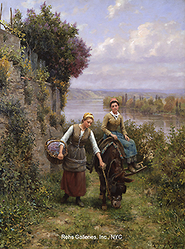 In 1875 he painted a painting called Wash Day (35 1/2" x 51 1/4") after a sketch by Meissonier for which he received critical acclaim. 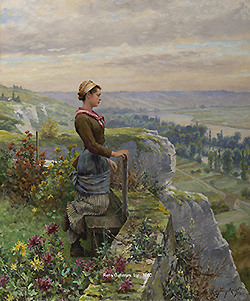 Knight was also strongly affected by the works of Jean-Francois Millet. 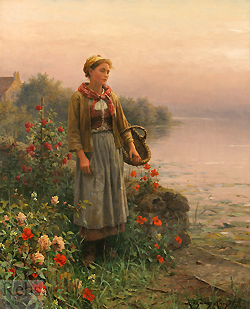 In 1874 while painting in Barbizon, Knight went to visit Millet and found his view of peasant life to be too fatalistic. 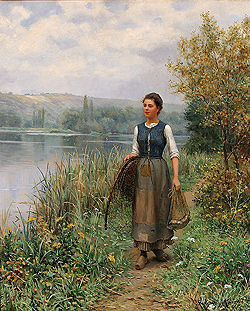 As opposed to Millet, Knight focused on depicting the rural classes during their happier moments. 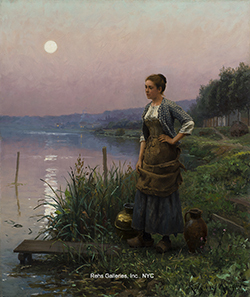 Other important influences were Bastien-Lepage, with whom he is most often compared and Jules Breton for his plein-air style. 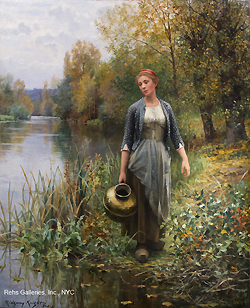 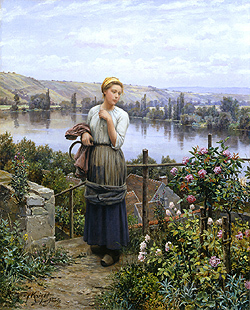 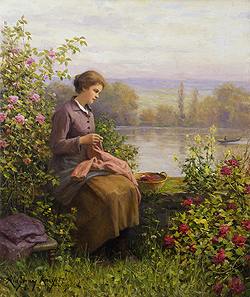 Knight's works during the 1870's and 1880's focused on the peasant at work in the field's or doing the day's chores - collecting water or washing clothes at the riverside. 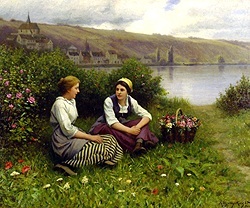 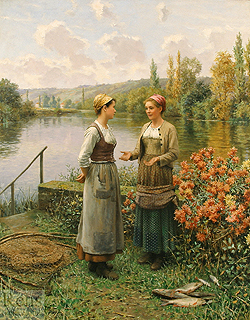 His painting Hailing the Ferry, painted in 1888 and currently in the collection of the Pennsylvania Academy of the Fine Arts, depicts two peasant girls calling for the ferryman on the other side of the river. 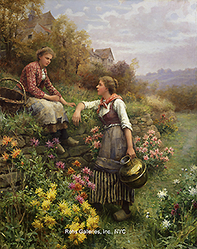 This work, considered one of the artist's masterpieces, captures all the elements of his pre-Rolleboise period - the subdued light and color, the finely detailed figures and the artist's acute attention to detail. 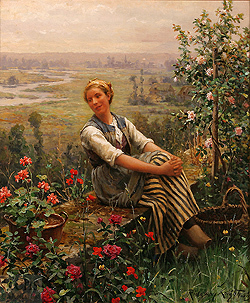 By the mid-1890s, Knight established a home in Rolleboise, some forty miles west of Paris. 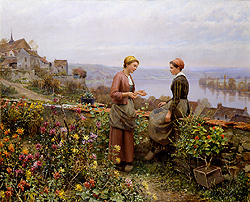 Here he began to paint the scenes that were to make his work so sought after by contemporary collectors - views of his garden. 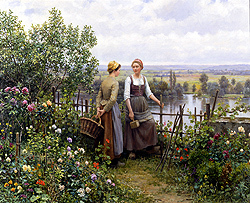 His home had a beautiful garden terrace that overlooked the Seine - a view he often used in his paintings. 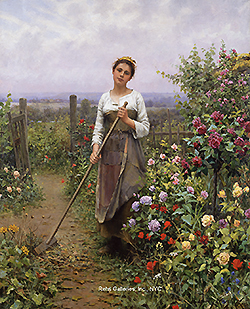 Collectors from across the globe vied for these works which featured pretty local girls in his garden. 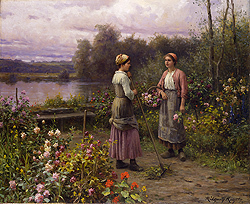 Works from this period include The Roses currently in the collection of the J.B. 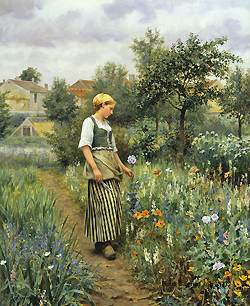 Speed Museum and The Letter in the Joslyn Art Museum - both of which feature pretty young women surrounded by lush flora. 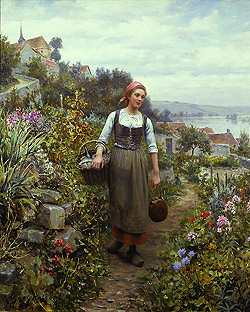 Landscape at Sewickley, PA. (n.d.) - Springville Museum of Art, Springville, UT.